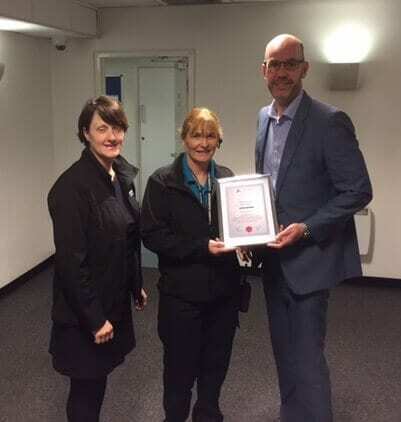 We were delighted to present an Employee of the Month certificate & a £50 New Look voucher to Tracey Sherlock, our wonderful cleaning supervisor at the Cornmill Shopping Centre for, not only taking the time to tailor some of her colleagues workwear in her own time…..
but also for the fantastic levels of support which she has given her team, the standards that have been delivered and the way Tracey has conducted herself impeccably since we were awarded the contract at the Cornmill Centre late last year. Pictured with Tracey is Sue Young, Centre Manager and Alistair Clayton, Commercial Director, Aston Services Group. Many thanks Tracey – keep up the great work!! !